Interest in hot and spicy food originates in my Louisiana heritage. Growing up in central LA, I never was in a café or restaurant that didn't have a bottle of Tabasco® or other hot sauce on every table. Family friends and relatives had home-made 'pepper sauce' [chiles in vinegar] on the table, sometimes in a cut-glass cruet! This concoction was [and still is] considered in some culinary circles an indispensable condiment for the proper enjoyment of such southern viands as turnip greens, collards, and peas [NOT green peas---black-eyes, crowders, pink-eye-purplehulls, Mississippi silvers, zipper creams, etc.!]. 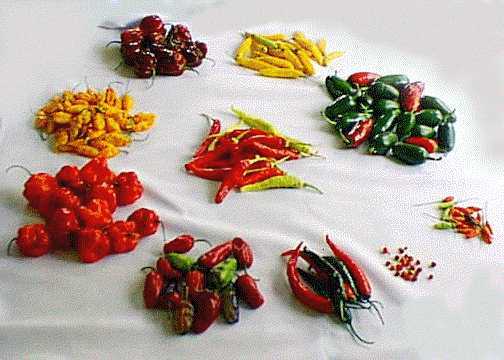 It was not unusual to see strings of 'hot peppers' [cayennes, usually] drying on back porches since ground cayenne (along with sage) was the major flavoring ingredient in the pork sausage, head cheese, etc. that were made on every farm. An old family friend, Mrs. Blanche Lewis taught me how to make chile con carne when I was a teenager ["a can of beef or pork, a can of water, and 2 tablespoons of Gebhardt's!"]. My palate was educated further during college years at LSU by [now] longtime friend and mentor, San Antonian Clifford Zirkel who with his wife introduced me to Tex-Mex food and taught me how to make enchiladas. 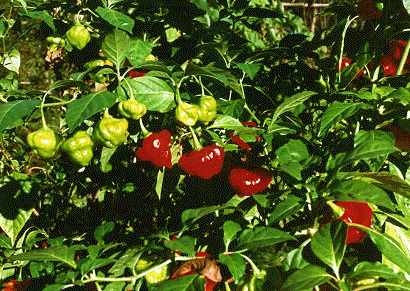 Growing chile peppers on our farm, Gator Slide, was initiated nearly 20 years ago by the gift of some "hot-pepper plants" by an old Micanopy friend, Mrs. Bessie Ambrose. The plants turned out to be Tabascos and I was hooked; much has happened since. Dibbie, my better half, likes spicy food as much as I. Her horses contribute a by-product that very effectively augments plant growth in the garden. Mystery Chile: Can You Help Identify It? 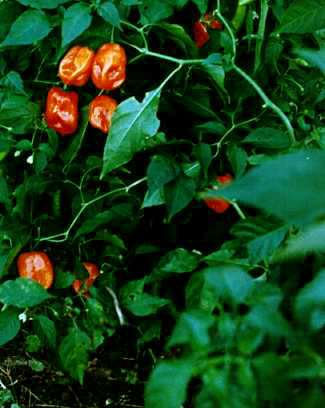 Gator Slide Chilies: Digital images of some of our growing chile peppers. Height ~ 1 m . Fruits 5 to 9 cm in length, 1 to 1.5 cm diameter, turning from green to yellow. Somewhat pointed at bloom end. Clearly C. Baccatum from the tiny green dots appearing on the flower petals. Rocotillo (C. Chinense). Our favorite chile! "Bird's Eye" [Chiltecpin]. 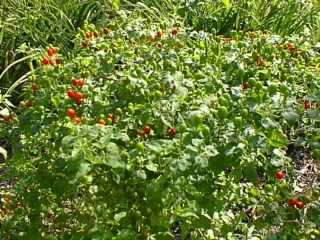 (C. Annuum). Originally from seed given to my mother by a great-aunt in Monroe Co. Mississippi. Fruit diameter ~ 1 cm. 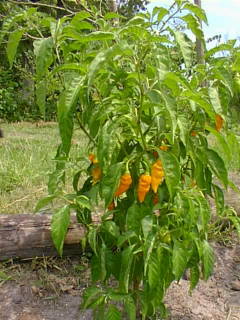 Datil (C. Chinense). Fruits approximately 1 cm diameter x 3 cm long.